Specializing in luxury residential properties in Boca Raton, Delray Beach, Highland Beach, Miami, and Jupiter Florida markets for more than 28 years Polly has established herself as one of South Florida’s most respected Realtors. Her experience, knowledge and expertise have earned her a reputation and distinction of being ranked among the top 4% of Realtors companywide. She has a proven track record with exceptional representation, proven success and global strength. She is affiliated with and utilize all the resources of Coldwell Banker Global Luxury International, a world-renowned luxury real estate market leader. 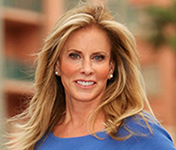 She has assisted distinguished homeowners in buying and selling some of South Florida’s most special properties. With a genuine interest in each and everyone of her past, present and future clients she delivers results! Her personal involvement and commitment to her community have enabled her to represent community leaders, celebrities and professional athletes with their real estate needs. She was recently inducted into the prestigious “Who’s Who in Luxury Real Estate” network and is a member of the Luxury Marketing Council and exclusive Master Brokers Forum. Additionally, she is a certified Coldwell Banker Global Luxury Specialist, a graduate of the University of Miami and affiliated with the University of Miami Citizen’s Board, the Boca Raton Chamber of Commerce, South Florida Jewish Federation and Friends of the Orphans. She resides in Boca Raton.